The U.S. Federal Aviation Administration (FAA) has issued an emergency order suspending Darby Aviation’s air carrier certificate until the company demonstrates to the FAA it can conduct operations in accordance with regulatory requirements. Darby Aviation has failed to produce an acceptable Operations Manual or an approvable training program despite repeated FAA efforts to inform the company of the required changes in those documents. As a result, the company has no accepted Operations Manual or approved training program. The FAA also has determined that Darby Aviation’s chief pilot and its Director of Operations are not qualified to hold their positions. The company’s lack of proper operating guidance and its failure to follow basic regulatory requirements has undermined the FAA’s confidence in Darby Aviation’s ability to ensure safe operations. Based on those considerations, the FAA determined that emergency action was necessary. Darby Aviation may appeal the emergency order within 10 days of receiving the order. 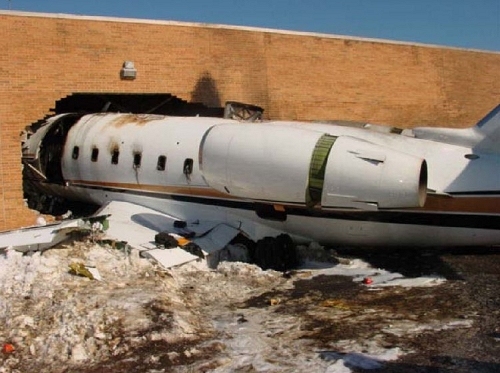 Darby Aviation was involved in a runway excursion accident in February, 2005. a Canadair Challenger CL-600, N370V, ran off the departure end of runway 6 at Teterboro Airport (TEB), NJ, at a ground speed of about 110 knots; through an airport perimeter fence; across a six-lane highway (where it struck a vehicle); and into a parking lot before impacting a building. The two pilots were seriously injured, as were two occupants in the vehicle. The cabin aide, eight passengers, and one person in the building received minor injuries. The airplane was destroyed by impact forces and postimpact fire.